CLEVELAND (AP) — Something shocking has happened to the Browns, those bumbling, fumbling, quarterback-searching, coach-firing, draft-busting losers. They’ve disappeared. Maybe gone for good. With an impressive 35-20 victory at Cincinnati on Sunday, the Browns (4-6-1) not only ended their 25-game road losing streak — one shy of the NFL record, but they posted consecutive wins for the first time since 2014. Cleveland also broke a seven-game skid against the Bengals, exacted some revenge on former coach Hue Jackson for rejoining a division rival, and pushed itself into the AFC playoff conversation, albeit as a long shot. As November fades, the Browns feel they’re getting stronger. “Being in the hunt in December is all you can really ask for when you start the season,” linebacker Joe Schobert said Monday. “Just to have meaningful games is big for the morale in the whole building, and as well as the fans and fan base that has been kind of starving for wins the last couple of years. The surge didn’t seem possible a few weeks ago after Jackson and offensive coordinator Todd Haley were fired following an Oct. 28 loss in Pittsburgh. The same ol’ Browns were still sinking. 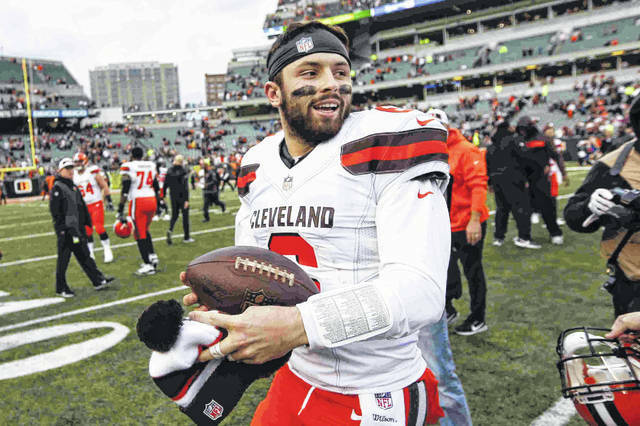 But under interim coach Gregg Williams, and with running backs coach Freddie Kitchens calling plays better suited for Mayfield’s strengths, the Browns have turned around their season. They’re 2-1 since Williams took over and there has been a noticeable change in the team’s temperament. Penalties are down, the Browns are playing with a crispness and purpose, and they’re backing up big talk with bigger actions. Tretter, who has played the past month despite a severely sprained ankle, said Williams’ influence has been dramatic and decisive. Tretter said Williams has placed a premium on attention to detail. He’s holding players accountable for their mistakes and giving everyone clear expectations. “They’re spelled out for you, there’s no confusion about what’s going on,” Tretter said. “Every meeting hits on the same points over and over again, where there’s really no gray area of what’s expected of each player on this team. That has really helped us take that next step. Williams will interview for Cleveland’s full-time job when the season ends, and while his resume gets a boost every time the Browns play well, his chances of being hired seem remote. However, as long as the Browns keep winning and Mayfield continues progressing, Williams’ stock will rise. The 60-year-old’s powerful personality has also rubbed off on his players, who didn’t miss a chance Sunday to get in their shots at Jackson, whether it was safety Damarious Randall handing the former coach the ball after an interception, or Mayfield giving him a cold shoulder following Cleveland’s win. Williams said he’s just being himself, and downplayed his impact as a disciplinarian. Williams had been reluctant to mention any playoff possibilities, but last week used the postseason prize as a motivator to reinforce a bigger message: The Browns can make this season special. NOTES: Williams reported no major injuries from Sunday’s win. … Williams said he “can’t keep up with my texts and my voicemails” from friends and colleagues around the league who are impressed with the Browns. “It is not going unnoticed,” he said.